of peer-reviewed, interactive, web-based materials to help a global audience of students, teachers, science professionals, and the general public see and understand the science needed to inform responsible decisions about climate change. 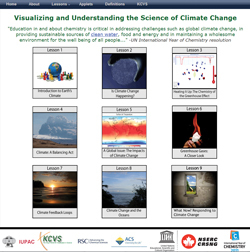 Resources were developed over a five-year period by faculty and undergraduate students at the King’s Centre for Visualization in Science (Canada) as an IUPAC and UNESCO project in collaboration with chemists and educators from the Royal Society of Chemistry (UK), the American Chemical Society, and the Federation of African Societies of Chemistry. Additional financial support was provided by Canada’s Natural Sciences and Engineering Research Council through the CRYSTAL and Undergraduate Student Research Programs. The King’s Centre for Visualization in Science is a research center of The King’s University College, Edmonton, Alberta, Canada. The center is committed to improving the public understanding of science in Canada and globally through the development of innovative ways to visualize science. Professors Brian Martin and Peter Mahaffy are co-directors of the center, working with a talented interdisciplinary team of undergraduate researchers. This past year, almost a quarter million visitors from over 100 countries accessed KCVS resources.